Dealer.com is the automotive industry’s leading website provider, offering uniquely tailored desktop, mobile, and tablet experiences driven by robust analytics and the nation’s deepest car-shopper knowledge base. Precise inventory and incentives automation drives website engagement, while holistic SEO maximizes reach. Pros: Likes how the platform works. Easy to manage. Not real exciting but it works for us. Pros: Good advertising tool with much information. OK but complex to manage! Pros: Our store has used them for a long time. I find it cumbersome. Cons: It's all I know but there are always problems. Pros: Informative and accurate. It is also easy to manage. Pros: I get many leads through this site. really happy with this website. Pros: It is easy to use and it a great platform. We also have great customer support. Pros: We are happy with our website. Pros: Great team to help us build the site. Simple and easy system to use. Pros: We like Dealer.com. One of our best sources for leads. Cons: upgrades would be good. Seamless Design: Dealer.com sites offer dealerships the flexibility of page-level customization for each device (desktop, tablet, and mobile) along with the automation of content across all devices. The seamless model is a hybrid of responsive and adaptive sites. Heat and Widget Maps: Heat-mapping gives actionable insights into how shoppers are using the site across devices. Widget mapping specifies the number of clicks within each widget. A/B Testing: Web editors can test performance of recent site edits against an existing site page within Composer (Dealer.com backend tool). Trim-Based Inventory Search: The site includes in-depth, model-specific landing pages with vehicle descriptions by trim level to help support the dealers SEO strategy. Content rich Inventory listings and Details pages: SRP and VDP include automated manufacturer and dealership incentives on a trim level basis, broken out vehicle package information, and video for all vehicles. Dealer.com was founded in 1997 and is the website provider for over 17,000 dealerships nationwide. The company has exclusive and/or preferred relationships with numerous automotive OEMs. They can provide dealers with multiple design templates that conform to OEM parameters, ensuring brand compliance. The Dealer.com website platform is built utilizing HTML5. It incorporates a “seamless” design philosophy that provides the functionality of a responsive site with the flexibility of adaptive platform design, delivered using one unique URL address. This approach allows the dealership to create a custom mobile experience for the user that can help drive higher mobile engagement. The core website offering includes a breadth of tools and features including: content automation, an integrated video walk around for each vehicle, inventory management tools, MyCars shopping list for added insight/customer engagement, and A/B testing in the backend management tools. A dedicated Digital Advisor partners with the dealership to identify opportunities and assist in the website’s success. Dealer.com’s platform offers dealerships a hybrid of responsive and adaptive design. Responsive designed websites utilize one common template across all devices and size content accordingly. Adaptive sites are created using templates that are unique to each device and deliver the content with a unique URL. 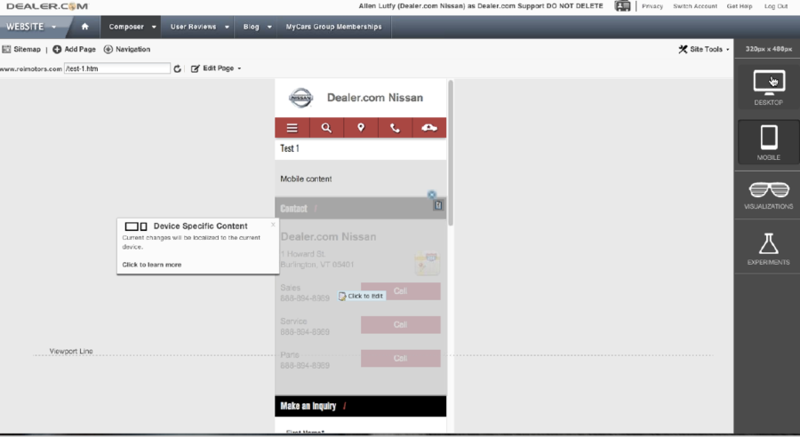 Dealer.com’s “seamless” structure offers the flexibility within the content editor to adjust a page’s visual look and messaging based on the device. Edits made within the Composer backend tool are (by default) responsive optimized and remain consistent across devices, which automates site maintenance. However, customization by device is a feature available to the website designer. The device-specific HTML is still served on the same URL (this is called dynamic serving), which conforms to Google’s current best practices. Dealer.com offers website clients a design gallery of roughly a dozen base templates with thousands of variations provided through flexibility of fonts, colors, and branding elements. The website functionality and visual elements can be further customized through flexible widgets. With exclusive and preferred partner relationships with many OEMs, templates are also offered in brand compliant colors and fonts. A newly incorporated mega-menu feature allows the client to create a custom drop-down with both text (page selection) and vehicle images (shop by model), guiding the users to specific inventory. The mega-menu also allows the dealer to incorporate other pertinent information for quick access to the shopper. For example, a service mega-menu would drop-down with the traditional service page options (Schedule Service, Online Garage, Service Specials, etc.) as well as the full listing of service hours and coupon integration. The site includes in-depth, model-specific landing pages with vehicle descriptions by trim level. The pages are intended to match Tier 1 visual elements (what the consumer sees on the manufacturer site) with Tier 3 dealer websites. The additional descriptive content contained in these pages can be custom written, benefiting the dealer’s SEO strategy. Once a user selects a vehicle/trim of interest, the corresponding listing of vehicles in inventory is displayed by trim level. Incentives Manager is included in the core offering and provides a tool that accurately automates OEM Incentives and dealer specials for display on SRPs, VDPs, and digital ads. The tool allows the dealership to control and adjust individual incentives and set up alerts/approvals before deployment. With Incentives Manager active on the site, the SRPs can show a variety of discounts, incentives, and the resulting final price. Search by keyword, body, features, packages, price, etc. Dealer.com offers Carflix video technology to its website customers as part of the core package. For vehicle listings with a minimum of four images, Dealer.com will automatically create a stitched video with human voice-over customized for the specific vehicle. For listings without dealer-supplied photographs, a model specific stock walk-around video will automatically be uploaded. Dealerships are also able to submit their own video for any vehicle. Images are available from the vehicle’s SRP page. A complete transcript of the video voice-over is automatically generated for use in a blog post with the video incorporated. The automated text transcript enhances the dealership’s customized SEO strategy. All videos are compiled in a video gallery where a shopper can click to view the post with full description. Video uploads are unlimited with Dealer.com. Dealers also have the option to automatically push video to their YouTube channel. MyCars is Dealer.com’s shopping basket solution that is available as part of the core website offering. The feature allows shoppers to save a vehicle short-list that becomes accessible across devices (after log-in). With MyCars, salespeople and BDC representatives have the opportunity to engage customers in interactions prior to visiting the dealership by encouraging shoppers to build their list so the salesperson can prepare for their visit to the showroom. Dynamic vehicle status updates: vehicle sold, price change, incentives, etc. Digital Retailing is an add-on to the core package. Digital Retailing allows the shopper to initiate, structure, and save their deal online, saving time at the showroom. Find more about Digital Retailing in the Additional Vendor Offerings section. Leads captured online at Dealer.com can be fed to any CRM via Automatic Document Feed (ADF). A Certified Provider program is available for third-party integrations. Dealer.com offers a single-sign-on solution, called ControlCenter, for website customers to access all the website functionality from content editing to analytics and reporting. The ControlCenter also provides quick access to support services including: Digital Advisor, and online tutorials via the dashboard. Individual users are able to configure their dashboards with real-time website metrics (with the ability to integrate Google analytics). The analytics section of the ControlCenter offers high-level metrics and comparisons with drill-down capability. 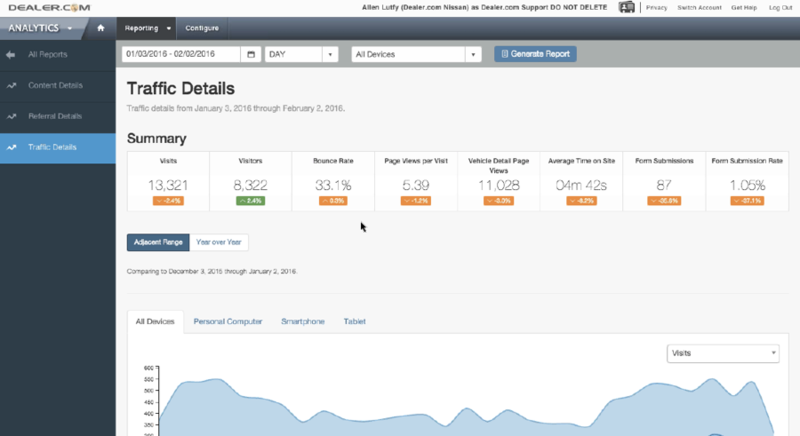 The content details summary shows page views, unique page views, visits, bounce rate, and average time on site with month-over-month and year-over-year data. All summaries are available for comparison across stores and to measure performance at an enterprise level. The dealership’s Digital Advisor is available to interpret and make recommendations based upon the comprehensive reporting. The available Dealer.com mobile application provides at-a-glace performance data and overall inventory health while away from the dealership. The website content editor is WYSIWYG or "what you see is what you get." Any area of the site that can be edited has a dial-in the right hand corner that the user can click to bring up editing options. A page builder tool offers templates to guide the editor and ensure cohesive design and widget placement. Content editing is completed through a text editor with capabilities to insert links, images, videos, and custom code. Composer integrates shopper behavior through a visual heat and widget mapping toolset. Based on actual users’ actions, the web editor can interpret the shopper experience and optimize the site, reduce clicks, and reduce scrolling across specific devices based on the mapping. An “experiments” section within Composer allows the web editor to perform A/B tests within the site. The editor can change widget placement, text, colors, sizing, etc. in “experiment mode”. The site will serve half of users the original version and the other half the experimental version and track key performance fluctuations like conversions and time on site. Composer allows the editor to name the experiment page, describe the edits and hypothesis, and track changes over time. The tool is especially useful for enterprise/groups, as edits that have proven successful on one site can simply be pushed to stores throughout the group. The Inventory Digital Marketing tool synchronizes digital marketing and lot merchandising by establishing rules and automating price adjustments based on inventory life cycles. The tool can provide a snap shot of individual inventory metrics: website views, MyCars saves, and Internet leads. In addition, the tool highlights missing components like video or images to red-flag incomplete VDPs. The Digital Retailing Tool augments the MyCars short-list capabilities and facilitates the process of online deal creation. The workflow is non-linear allowing consumers to self-direct their process and pick up where they left off across devices. The Digital Retailing process includes: valuing the trade, personalize payment (with dealer controlled lender integration), protection plans, pre-qualification, credit application, and vehicle reservation. Each step shows the shopper an amount of time saved for completing the process online versus visiting the store. The process is available directly from the VDP of the selected car. PaymentDriver: Personalized payment as shopper dictates term, down payment, finance/lease, conditional factors, etc. FinanceDriver: Secure pre-qualification and credit application completed online (seamless integration available for Dealertrack users). Reserve It Now: Removes the vehicle from listing pages, notifies the dealership with customer info, and reserves the vehicle with a $500 deposit via PayPal. Managed Services provides dealership campaign support in three major areas: content/creative, SEO, and social media. Various levels of support are available to dealers. At a minimum, a campaign coordinator works along with the Digital Advisor and dealership team to strategize monthly. The coordinator then facilitates the development of assets to support the strategy utilizing a team of copywriters in Burlington, Vermont. Assets may include: graphics/images, display advertising, social/blog posts, custom copy, etc. Dealers opting for the SEO package in Dealer.com Managed Services receive blog functionality on-site (this is separate from and in addition to the inventory video blog). For dealers not using Managed Services, a stand-alone blog is an optional add-on. Generally a dealer can expect a 4 to 6 week timeline for site setup with Dealer.com. An express 2-week setup is available for a completely out of the box solution with updates and personalization following the go-live. When a dealer signs up for a Dealer.com website, they are assigned a Production Manager that facilitates the site setup. The Production Manager is dedicated to actually building the site and communicating with the dealership’s contact person to confirm domain, design, DMS integration, and due date. When the site is near go-live, the dealership is assigned their Digital Advisor. The Digital Advisor is the go-to person for the dealership for the life of the site. This proactive account manager is responsible for basic training of dealership staff, interpreting reports (including a monthly performance review), communicating best practices, quarterbacking technical support, and identifying opportunities and areas of improvement. Dealer.com also has 24/7 phone assistance and e-mail support. Managed Services is available for dealers looking for support in content creation, creative, SEO, and social media. Dealer.com has exclusive relationships with Audi, FCA, Subaru and Volvo. They are dual-exclusive (one other provider) or preferred partners for many other OEMs. The standard website contract is 12 months. Pricing and terms will vary based on provider relationships.